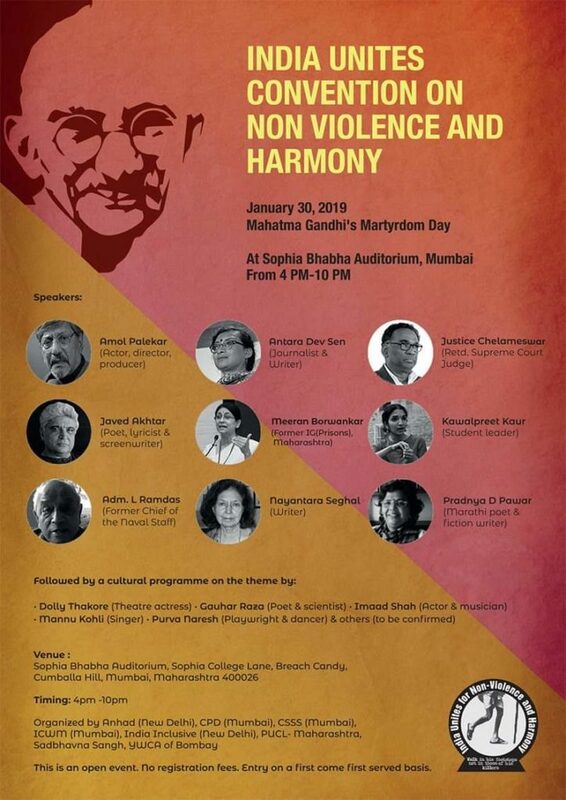 India Unites for Non – Violence and Harmony is a non-political, citizen led campaign being organized from January 23- 30, 2019 to commemorate the 71st anniversary of Gandhiji’s martyrdom. 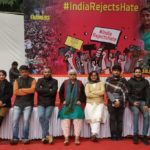 Various civil society organizations, academics and activists are coming together on the anniversary of Gandhiji’s martyrdom to appeal to the nation to resist and confront the growing culture of violence facing the country. Mahatma Gandhi was shot dead on January 30, 1948 at 17:17 hours as he headed towards a multi-faith prayer meeting. He was assassinated by fundamentalist forces opposed to his idea of Swaraj promoting nation-building on the principles of equality of all citizens, Hindu -Muslim unity and communal harmony. Gandhi’s Swaraj focussed on the composite nature of Indian nationalism. 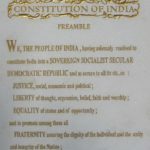 Under Gandhi’s leadership, the freedom movement successfully mobilized and drew people into the struggle for independence against colonial rule: men and women, people from all faiths, regions, speaking different languages, having varied castes, traditions, customs, cultures, beliefs and inhabitants of both rural and urban areas. He dreamt of an India where people lived together and respected each other’s differences; where interactions, protest and negotiations would be shaped by the principle of non-violence/ahimsa. 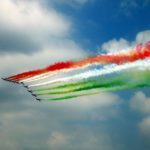 Today, 70 years after independence, we are witnessing a rise in hatred and prejudices based on religion, caste, gender, sexuality, region and class. Society is becoming increasingly intolerant and violent. Communal violence, caste based violence and hate crimes are on the upsurge. As citizens we can no longer be silent spectators to this growing ill will, hatred and violence. We must come together to protect the secular, pluralistic and democratic fibre of the country. This is an open event. No registration fees. Entry on a first come first served basis.